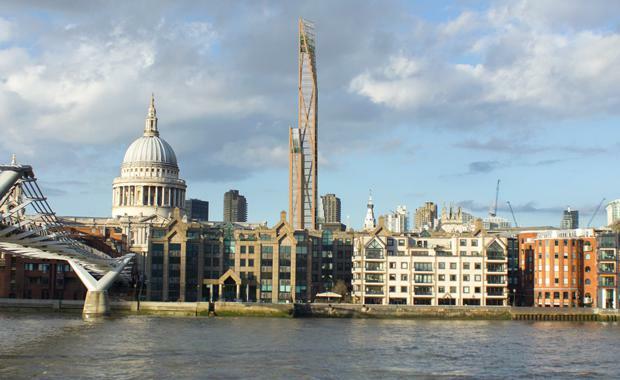 Plans for London’s first ever wooden skyscraper, Oakwood Tower, have been revealed. If the building comes to fruition it would be London’s second tallest building and the tallest wooden structure in the world. London Mayor Boris Johnson has been presented with plans by PLP Architecture and researchers from Cambridge University’s Department of Architecture for the 80-storey building. At 300 metres high it would be the second tallest in London only to The Shard which sits at 309 metres. The wooden tower would be located in the Barbican complex in central London. The world’s tallest timber building currently is a 14-storey apartment block in Bergen, Norway. In a statement, Dr Michael Ramage, Director of Cambridge’s Centre for Natural Material Innovation, said: “The Barbican was designed in the middle of the last century to bring residential living into the city of London – and it was successful. We’ve put our proposals on the Barbican as a way to imagine what the future of construction could look like in the 21st century. Cross-laminated timber, an engineered wood consisting of laminated timber sections, is making many new larger timber structures possible according to UK architect Andrew Waugh.